It looks like this will be my last post. I've learned a lot since coming here to Sapporo - of course I've learned a lot of Japanese, but I've also learned a lot about myself. As I've spent time with new friends and friends from way back when, I have realized things about my own heart and the world around me. (As cheesy as that sounds...) Of course people are different throughout the world, but really, humans are humans, and I've come to understand that wherever I go I am part of the same family. Rather than thinking of myself as a person from such and such a place and belonging to so and so's group, I have started to think of myself as part of this universal body. Anyway, I've learned a lot of various things =]. 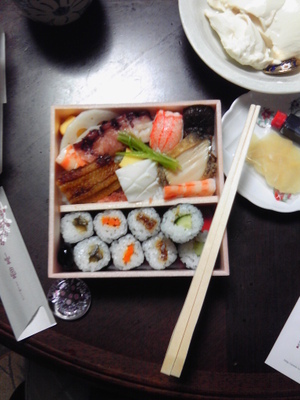 Japan has tasty food, and the people are so nice! If you're worried about whether you should come or not, just come! You'll be glad you did. 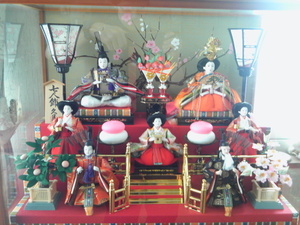 Recently we had the Doll Festival, which happens every year on March Third, Girls' Day. 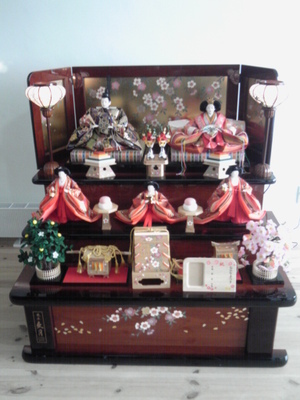 On that day, there are festivities all over Japan, many of which involve these beautiful doll sets which can be seen in people's houses and in department stores. I took some pictures, so please check them out! Also, if you say "Japan" I think there are lots of people out there who think of the traditional Japanese Lunchbox, or bento. But as it turns out, if they're not handmade, there's the fear called "bad taste". For example, at Lawson they have "Bento" but it's not the sort of thing you would want to eat, if you get my drift. However, I have found a really good bento shop here in Sapporo. It's called TubomiTei and you can eat really tasty bento there. If you ever come to Sapporo, please try it out! Even in LA there's a store called Kinokuniya. They sell books and music and stuff, so you can go there to touch Japanese culture. Of course they also do business here in Sapporo, and I think they're probably the biggest book store in Central Ward. I went there today to have a look around and ended up buying a book on how to use Kanji. Whenever I go into that store I get all nostalgic and start remembering my life back in Los Angeles. Back in my college days, there was no other place to get records from my favorite artists like Shiina Ringo and Utada Hikaru. Because of this, Kinokuniya also became one of my favorite places. I still feel like living in Sapporo is living out in the boonies, but it's not so bad because of stores like this.